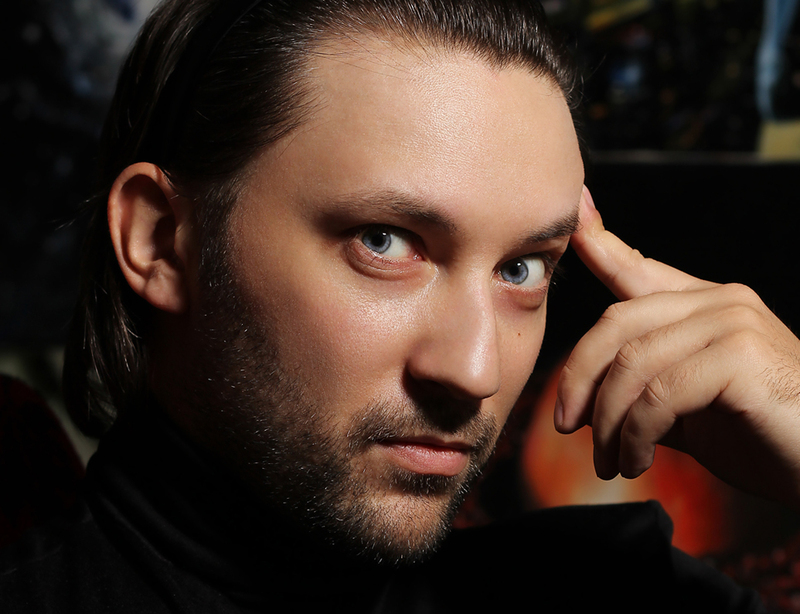 Serge Feeleenger: If we want to understand the World, we should create the World. The whole consists of parts. A part consists of particles. Particles are formed of energy. Vibration ... Waves ...What makes energy to vibrate? What makes it vibrate in different ways? What makes the energy to acquire a shape bringing together waves? Something tunes the energy in the way that it makes vibrations at the frequency of other particles. This is the Symphony of the Universe. It is music that makes the life. Musical notes are just like formulas... It is a language of registration and cognition. 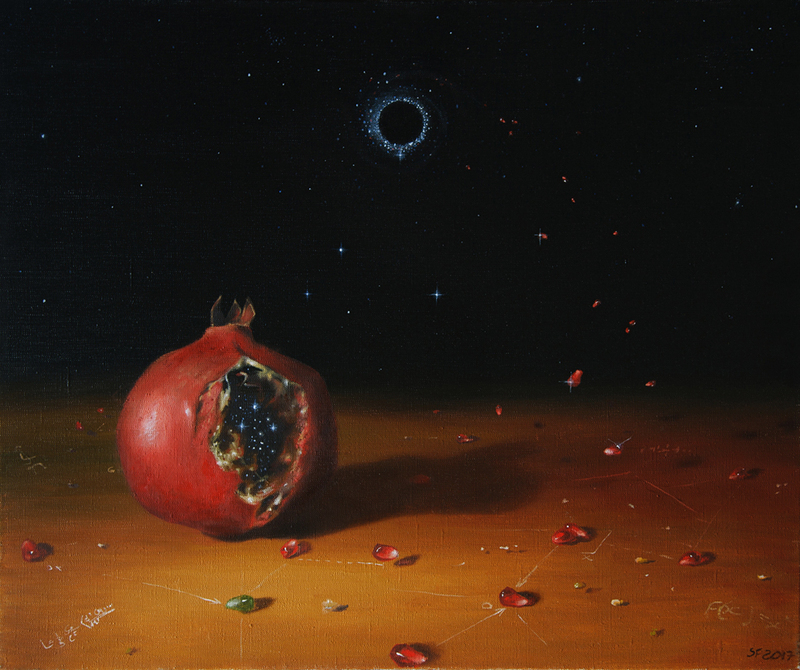 It is the Green Grain of a pomegranate. It is a part of the whole, but an exception from the rules. It is an effect of one individual personality in a society. A personality that complements and develops the society. The exception from the rules is a way out from one system and the entrance to a completely new one. It is a symbol of freedom and endless evolution. "The Cause of the Cause" is the main formula that proves the infinity of the Universe in all imaginable and unimaginable dimensions. There was no void before the Big Bang. There was a detonator. The cause. This cause also had a cause and so ad infinitum. The Symphony of Attraction. Clean Energy and The Physical form. 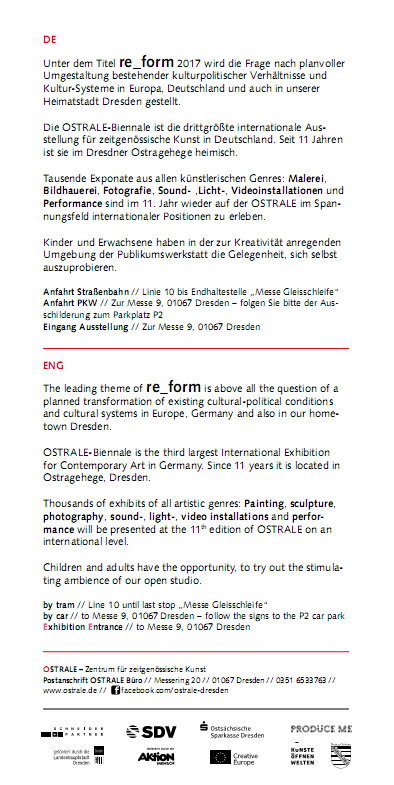 OSTRALE – Biennale is the third largest exhibition for contemporary art in Germany. It is not a sales exhibition per se, which gives us the freedom to discuss socially relevant issues apart from the market development. 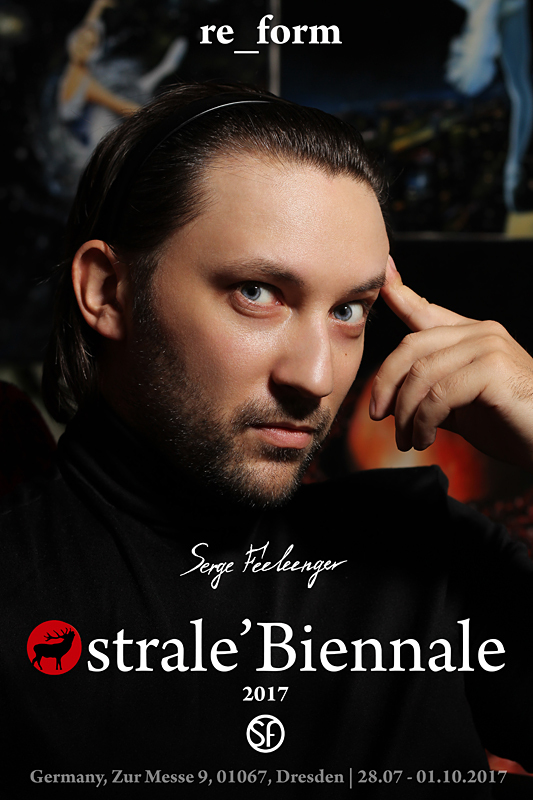 OSTRALE’s guiding principles, such as peaceful coexistence, acceptance of the stranger / unknown, respect for each other, religious diversity and internationality, are reflected in the exhibitions. There is close cooperation with Dresden institutions, collectors and galleries as well as with international curators, biennials and cultural institutions. This is how new ways and possibilities are opened up to go abroad. Among other things, we will be in the European Capital of Culture in Valletta (Malta) in 2018. Furthermore, we maintain good contacts with Saxon schools, which use the OSTRALE for educational purposes. 9,300 pupils and students were at the OSTRALE in 2016 alone. 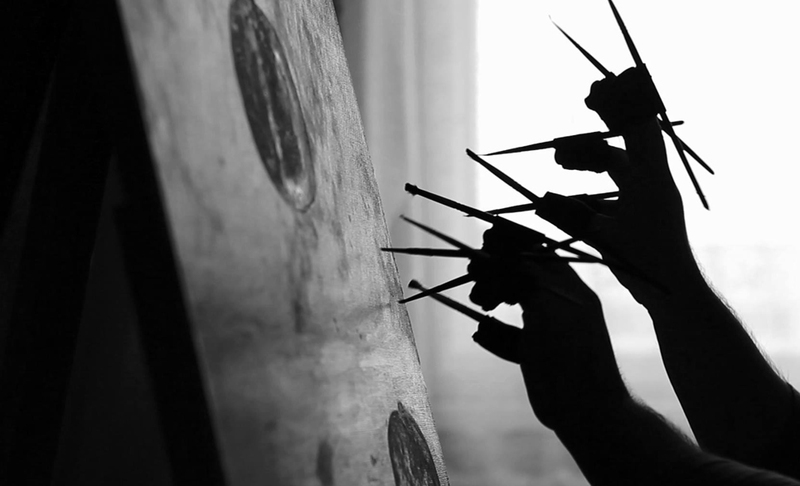 In addition to the exhibition, we offer an extensive framework program (music, dance, performance, etc.). The barrier-free infrastructure, a blind and hearing-impaired app, as well as targeted workshops with special target group participation, enable socio-cultural participation. By definition a reform is a systematic and non-violent change of existing conditions without ignoring the essential intellectual and cultural foundations. The aim of a reform is improvement. Contemporary Art can ask questions and generate solution approaches in a nessecary re_form-process. 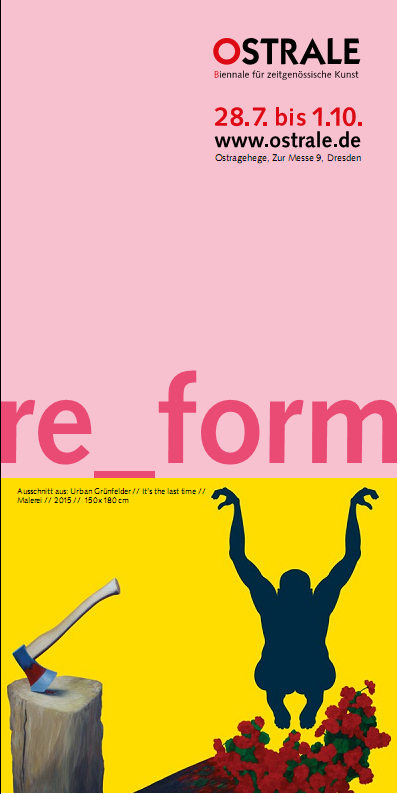 The guiding theme „re_form“ deals especially with the question of organised change of existing cultural policy and cultural systems in Europe, Germany and particularly in our town, that is preparing to apply as „European Capital of Culture 2025“. By switching from an annual exhibition to a Biennale-concept OSTRALE itself is in a state of re_form. 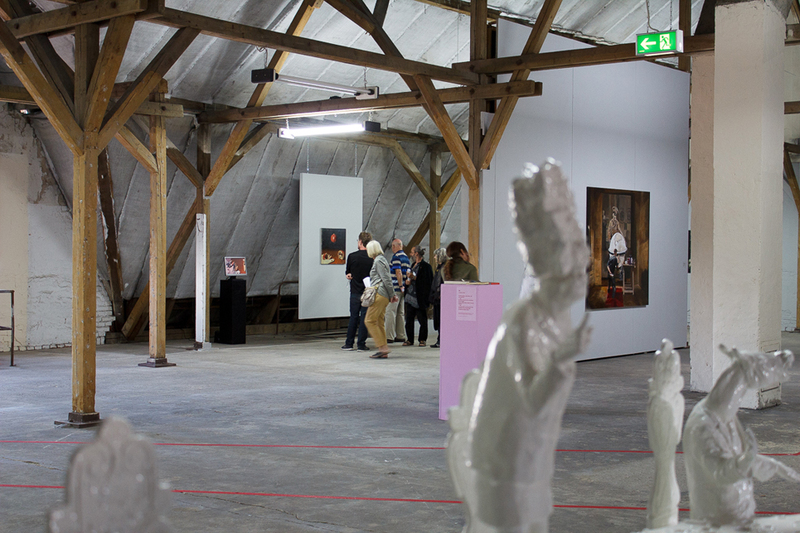 Furthermore, the special exhibition space of OSTRALE in the heritage protected buildings of the outstanding architect Hans Erlwein have to be rehabilitated after the exhibition in order to enable a further use. 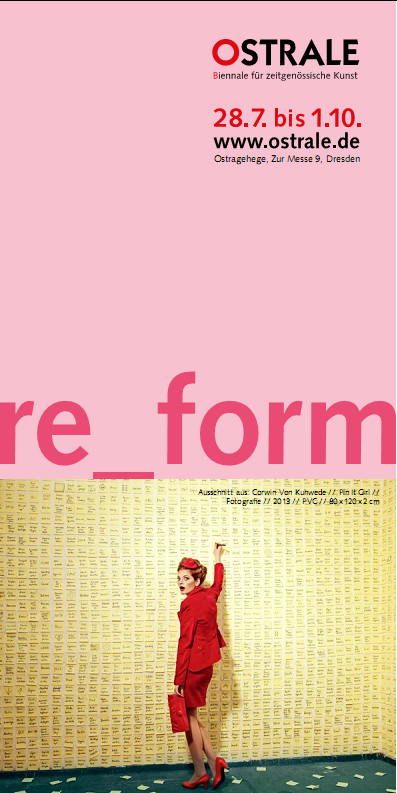 re_form is a basic element of Art and essential feature of creativity and artistic work. The pieces of Art function as mediators. Unlike the times of the Avantgardes it seems today that statements of novelty in Art are mostly based on rediscovery and forerunnership. What moves artists to turn increasingly to role models and how do the associated homages, references, quotations and appropriations reveal in the respective piece of Art? Which prospects emerge for the future from studying the past? The 11th edition of OSTRALE will take up an essential topic of the European Capitals of Culture: We raise the questions about human identity and new spaces in light of the refugee and migration movements in past and present, an amplified tendency toward nationalism as well as the dissolution of the European community of values (e.g. „Brexit“). Could Art in its materiality be a bridge between different identities, that overlap but don’t merge? 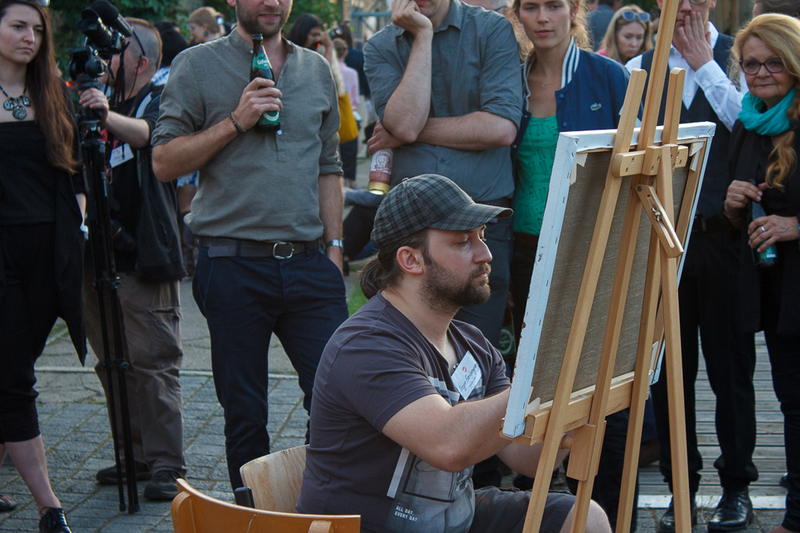 If cities brand themselves as creative, economic growth will follow. This was stated by Richard Florida. The american economist saw a correlation between the economical strength of an urban region and the relation between highly industrialized workers, artists, musicians and homosexual people. Florida’s theory found its way into urbanism and city planning. But: Who will profit from the generated prosperity? Frequently „creative professional groups“ form a complete city zone and make it more attractive just to watch a following, ruthless economic takeover! 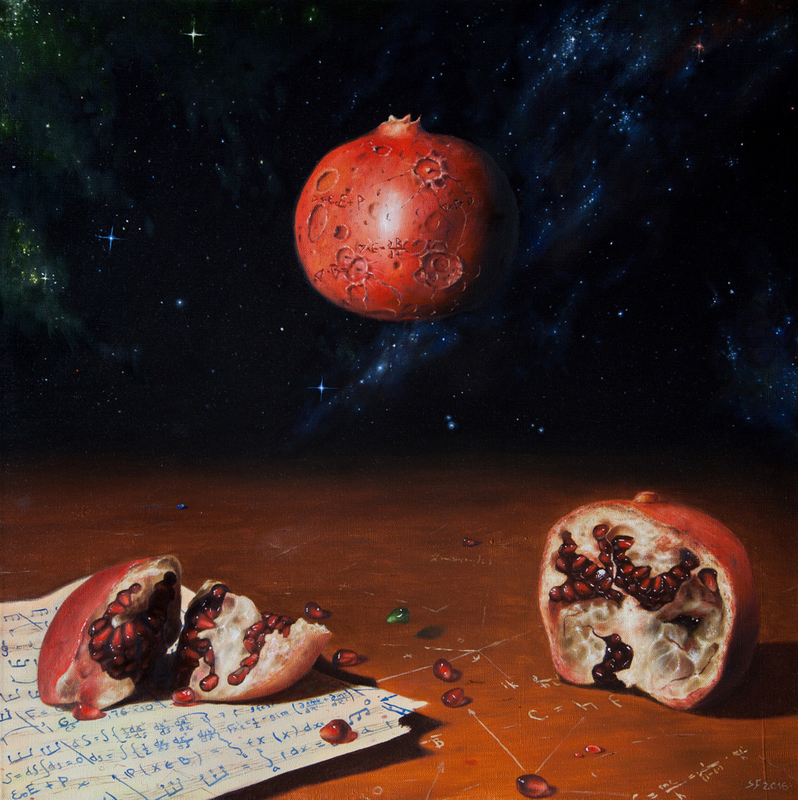 Travelling to Art places, especially if they are out-of-town and in relatively unknown areas, can touch, amuse, influence or even change humans as strongly as Art itself. The journey creates new ways of thinking. It is important to show Art even on hard-to-reach locations. The involved voyage is a meaningful effort, physically and mentally. The placarding of the 95 propositions 500 years ago paved the way for a new and free, independent thinking and the freedom of conscience concerning faith and Christian doctrine. The human being has a free will – especially making seperate choices concerning religious matters. What do we think about this issue today?